Welcome to MJ's Raw Bar & Grille! We welcome everyone with a smile! C'mon down for Lobsters, Oysters, Crabs, Burgers, Steaks and More! We pride ourselves on fresh food & superior customer service. Located in the heart of beautiful historic New Bern, North Carolina, MJ’s Raw Bar & Grille offers wonderful seafood with a hint of 'Maryland' seasoning - great burgers, steaks and a whole lot more. Post by MJ's Raw Bar & Grille. 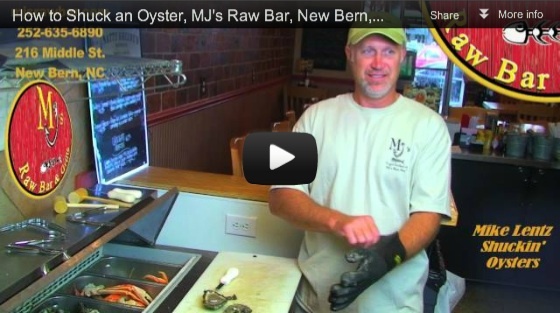 MJs Raw Bar and Grille was awarded by tripadvisor for 2012 the Certificate of Excellence Award; and the Sun Journal's Reader's Choice Award for 2013. Fresh Live Lobster Flown in from Maine! Live Maine Lobster at MJ's Raw Bar in New Bern, NC - For all the seafood lovers, WHOLE MAINE LOBSTERS are among the most fabulous choices. You pick it from MJ's Aquarium and we'll steam it hot and serve it with drawn butter.